It was no dark and stormy night, but the middle of a bright Florida afternoon when I spotted the mystery buoy. “What the heck is a green nun with vertical white stripes?” It was near our course, and I had no idea what it marked, so I brought the engines back to neutral and we drifted while I issued orders. A few evenings before, preparing myself for the buoyage of our voyage, I had bored her senseless with all the never-seen buoys from the pages of Chapman Piloting & Seamanship. Now Chapman’s had bitten me back. I grabbed the binocs to look for a number on the mysterious buoy, and—ta-da—problem solved. It was, in fact, a green buoy, but the vertical stripes were surprisingly neatly applied streaks of bird poop. Somewhere, I knew there must be egrets laughing and giving each other feathery highfives. Another skipper humiliated. As I eased the engines back into forward, I could feel SWMBO’s smirk in the hairs on my neck. I didn’t turn around. Visions of sugarplums may dance through kids’ minds at Christmas, but entirely different visions clog-danced around in my alpha waves after our first day on the water. My dream stream that night was a flickery newsreel filled with nuns and cans, yellow triangles and squares, speed zones and manatee areas. We were exploring the waters off Fort Myers, Florida, aboard one of the charter yachts from Southwest Florida Yachts, and it was proving to be an immersion course in buoy navigation. If Berlitz can teach you Greek in a week, SFY can help you remember everything you learned at that U.S. Power Squadrons course ages ago. The west coast of Florida is one of those secret cruising grounds that are overlooked because they are just so darned convenient. No foreign airports, no passports, no hassles with provisioning, and, though you’re in the Deep South, not much of a language barrier. But the cruising—oh, the cruising! 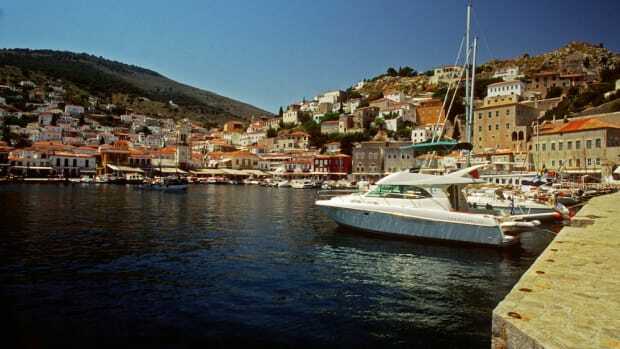 Quiet anchorages, sandy beaches littered with beautiful shells, and great marinas. There is something for every taste, regardless of whether your idea of fun is pub hopping until the wee hours or finding a beach with no footprints except your own. If you’re accustomed to bareboat chartering in the Caribbean, this is a different animal. First, there are no fleets of cookie-cutter, look-alike boats. Southwest Florida Yachts has an eclectic fleet of privately owned yachts that it manages in its charter program. 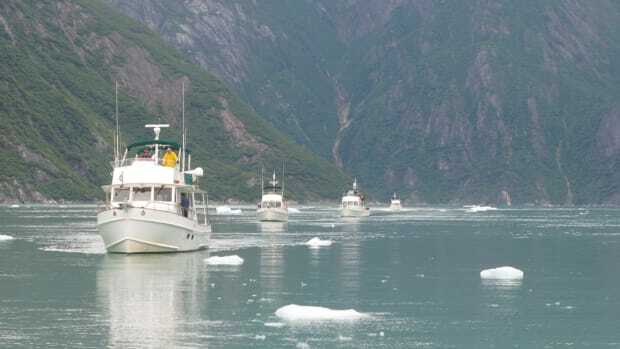 The boats in its power fleet range from a 28-foot Albin day cruiser to Grand Banks of various sizes to Mainships. Our choice was a Mainship 43 named And Everywhere, after the 1966 Beatles hit “Here, There and Everywhere”—which became the perfect description for our charter voyage. SFY has a great policy that allows charterers to spend the night aboard their charter boat before their charter begins. Not only does that save the cost of a hotel room, but it also allows time to unpack, check out the boat, and do a little last-minute provisioning at a nearby Publix. If you’ve chartered a few times, you know that charter companies vary widely, both in their offerings and in their level of maintenance. Vic and Barb Hansen have owned SFY for more than 20 years, and believe me, they run a tight ship. Before a boat gets into their fleet, it has to pass a thorough survey, and then it has to be equipped to a high standard to meet their requirements. In the case of And Everywhere, that meant we had all the expected items, from towels and bedding to local charts and guidebooks. But our yacht also was furnished with such niceties as a new propane barbecue, an Avon RIB on a hydraulic platform, a fiberglass hard top for sun protection, and a suite of Raymarine electronics that included a chart plotter and radar. I appreciated the 44-lb. Bruce anchor (perfect for these waters) on a Lewmar windlass with 100 feet of chain rode. Since Florida nights can sometimes be steamy (and buggy), the crew enjoyed three-zone Marine Air air conditioning, and SWMBO was happy in her fully equipped, all-electric galley. This was a swell ship, not a hell ship. The boat was in pristine condition when we arrived, and the staff was thorough and knowledgeable on everything from the location of breakers to finding the best burgers. Even better, several file boxes were neatly indexed with the manual for every piece of equipment aboard. Not sure how to work something? Look it up! SFY has two charter bases, but it keeps its power fleet in North Fort Myers on the Caloosahatchee River, which locals shorten to “the river” for obvious reasons. Convenient to major airports and highways, this is about 10 miles upstream from the start of the prime cruising grounds of southwest Florida. 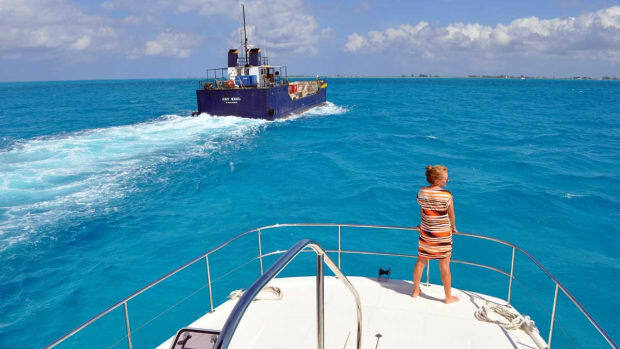 Charterers need go no further than the very doorstep of Fort Myers. Once off the river, you enter Pine Island Sound, a cruising wonderland. About 15 miles long and 4 miles wide, the sound is protected from the Gulf of Mexico by the barrier islands of Sanibel and Captiva. 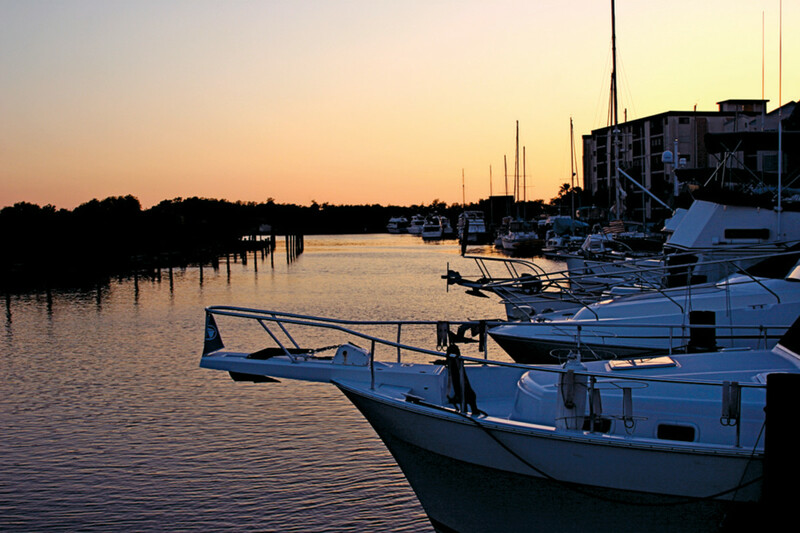 You could spend a delightful week without ever leaving Pine Island Sound, sampling a different anchorage or marina every evening, hunting for shells, or simply floating in bathtub-warm water. The second piece of advice was vital, because these waterways often are deceptively shallow: “White is all right; blue review.” Look at your chart and you’ll see that deeper water is shown in white, while shallow water is in blue. If you’re planning to tiptoe into the blue zones (which you will), review the chart beforehand. Carefully. Although we went through channels where I couldn’t bring myself to look at the depth sounder, we never touched bottom, and, according to the Hansens, even an occasional touch is rarely a problem because the bottom is generally soft mud or sand. Once you break the habit of sticking just to the main channels, Pine Island Sound and neighboring Charlotte Harbor have a multitude of little anchorages and protected waterways that offer solitude even in the busiest months. We took our time on the Caloosahatchee, looking at the sprawling homes on the river’s edge that date back to the days when this was the winter retreat of the likes of Thomas Edison and Henry Ford. Passing along the narrow channel near Shell Point, we threaded our way through hordes of fishermen drift-fishing in small boats and supplied with bait and beer by an entrepreneur aboard a pontoon-boat-mounted shop. We stopped for a leisurely lunch at the appropriately named Picnic Island, featuring an anchorage that’s well protected from southerly winds and a curving beach that hides an inner lagoon. Our destination for the day was the marina at the Sanibel Harbour Marriott. We had chosen to dock at this luxury property because it was a convenient place to pick up our guests, photographer Francy Cuevas and her musician husband, Francisco. We arrived in the afternoon and found the marina team to be very accommodating when it came to settling us into our berth. Later, the skipper of the hotel’s dinner cruise yacht checked in to make sure we were comfortable. 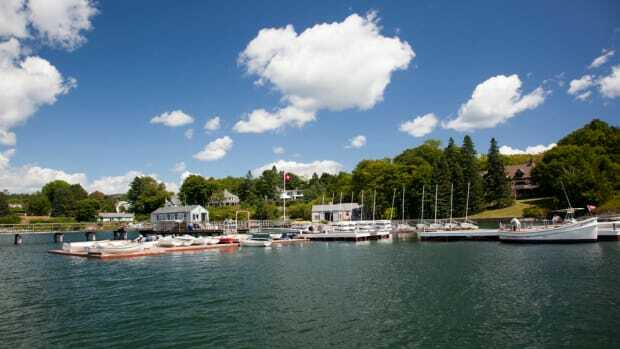 We’ve stayed at the hotel on several occasions (boatbuilders use the marina for new model debuts) and have always been delighted with the service, food, and accommodations. A lazy start the next morning sent us northward along the ICW (toward Texas! ), and we found that Picnic Island was already lined with sportboats on day trips. Moving on, we had our first encounter with the wild dolphins in Pine Island Sound, which amused themselves (and us) by playing in our bow and stern waves. In talking to other skippers, we learned that the dolphins seem to love boats; nearly everyone on these waters has several encounters with them. We tiptoed into the blue area of the chart (after review) at Ding Darling National Wildlife Refuge on Sanibel and dropped a lunch hook while admiring the view. This refuge has the largest mangrove ecosystem in the United States and is home to more than 200 species of birds, including the bald eagle. Back on the Intracoastal, we passed York and Chino Islands, protected from northeasterly breezes, and slid into South Seas Island Resort at the tip of Captiva. South Seas was decimated by Hurricane Charley six years ago, but, after a change of ownership and a massive rebuild, it now boasts an expensive marina ($3 to $5 a foot per night) and a glossy resort. With overpriced cutesy shops, mediocre but pricey restaurants, and a huge water park, it was too Disney-esque and deep pockets for us. After waiting out a spectacular lightning storm the next morning, we weren’t unhappy to move on. Nearby ’Tween Waters Inn Island Resort has a no less efficient but much more low key marina, with the bonus that you can literally walk across the narrow isthmus of Sanibel to hunt for shells or build sand castles on the long, white sandy beach. Built in the 1930s as the home of mystery writer Mary Roberts Rinehart, Cabbage Key has another notable claim: the most expensive wallpaper in the world. The Cabbage Key bar, with its original hardwood floors and fireplace, is papered with thousands of autographed one-dollar bills. Guestimates place the value between $40,000 and $60,000, but, hey, who’s counting? The owners gather up loose and falling bills and, when they reach $10,000, donate them to charity. A nice touch. Nearby is Useppa Island, a private island club that allows no cars (golf carts only) but which has a great marina available to SFY charterers since the Hansens are members. (For a feature on Useppa Island, see PMM Nov./Dec. ’07). Farther east is Pelican Bay, a well-protected anchorage at the tip of Cayo Costa that is a favorite among cruising skippers. We could have continued on into Charlotte Harbor and Gasparilla Sound, both with more appealing anchorages to explore, but time was running out. We’ll save them for our next cruise with Southwest Florida Yachts. It had been a delightful charter, with a good yacht, an attentive charter company, and a wonderful cruising area. Retracing our course down the ICW (away from Texas!) was a lot easier after several days of buoy practice. It had rained hard one night, so that vertically striped green nun was now washed to a solid green, although there was a heron sitting on it as we passed. I fancied he was grinning.